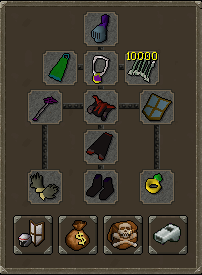 We'll be hosting a beta playthrough of the final stages of the Deadman Spring Finals later today. It's important to note that the purpose of the beta playthrough is to determine that the mechanics in-game work as expected, and it's not an opportunity to practise and refine your game plan. As such, we're opting to go ahead with the usual open first-come first-served policy to ensure that the world will be at capacity and allows us to gather the best possible feedback. We've changed the appearance of the arena section of the Permadeath Stage to better reflect the seasonality of the Spring Finals. The playthrough is going to be held on World 400. The world will be accessible from 3pm GMT (10am EST) and you will be given 15 minutes to login and prepare. The playthrough begins properly at 3:15pm GMT (10:15am EST). The event is expected to last around 90 minutes but will run through to its completion. The supply chests will be included in the beta playthrough. If you're intending to take part, we recommend visiting the Spring Finals Deadman page to see the major tournament content changes. We've also spent some time working on our spectator system and refining the overall viewing experience. We'll be keeping it all under wraps for now, so be sure to register for the event on our twitch page twitch.tv/OldSchoolRS to get notified when the tournament kicks off! This update also sees the introduction of a new feedback system in-game that will go live Monday 5th March. When logging out, you'll see a slightly updated interface showcased below - allowing you to share your feedback on whether you enjoyed playing Old School RuneScape. We believe Old School has been a success because we take your feedback seriously, and use it to improve the game. This minor change is designed to be as unobtrusive as possible - you don't have to rate your experience, but we believe it's important to give you the option to do so. We see this as another tool in our arsenal, and gives us another avenue to gather and understand your feedback. Logging out still works as normal and doesn't require you to select an option. 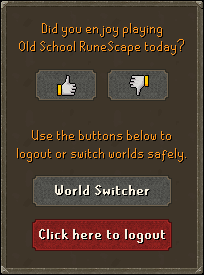 If you are willing to give feedback, all you need to do is select the thumbs up at the end of your game session if you've enjoyed playing Old School RuneScape during it (or the thumbs down if not) and then hit logout - your result will be sent to us once done. You can still expect to see our Community Management team getting involved in discussions and taking your feedback direct to the developers, but they will now have additional evidence which helps validate the feedback you give us, to make sure we're making fully informed decisions. We see this as a first step, and we'll be working to improve the system with your feedback. We've been closely monitoring data gathered from players interacting with the Revenant caves and recently made some changes, as detailed in this news post. 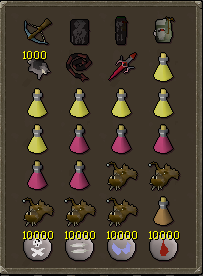 We want to ensure that the Revenant caves remain profitable, but also that their reward matches the effort and risk involved. Our initial batch of changes listed in the aforementioned news post intended to target players that were getting much more gold per hour than most, and the increase of resources being introduced to the game. Whilst we achieved that, we believe that after anlysing the new post-change data, we didn't quite hit the mark. In fact, we overstepped it a little with the reductions and so in this week's update we're making a few minor changes following our recent data analysis. When the caves are saturated with players, we often noticed that many players do not wear a Bracelet of ethereum as they very rarely take damange due to how many players are being attacked rather than them. This change should promote the use of the bracelet which is not protected on death. QoL month has officially finished and what a journey it's been! This year we've been more ambitious than ever, pushing to get as many of your most popular Quality of Life and low effort update suggestions done within a month. We took on a huge amount in the QoL month polls. Much of it's arrived already, but you'll be aware that we've got other things going on too, with staff working on preperations for the announcement of the Theatre of Blood, Mobile, and on preparing today's beta test, so you can expect the remaining QoL Month features to turn up over the next few weeks. 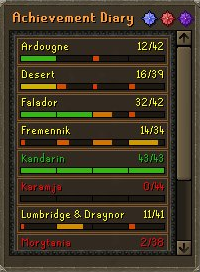 The Achievement diary interface has been given a new lick of paint - now visually showing how many tasks have been completed in each sub category of Easy, Medium, Hard and Elite. 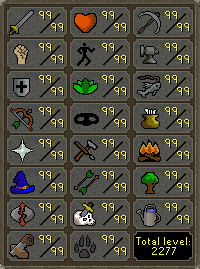 The "Total level" box in the stats interface has been repositioned to be more in line with the rest of the skill level boxes. Players will now have a warning when attempting to cast any wilderness teleports from the Ancient spellbook. This can be toggled on/off by right-clicking the relevant spell. Players who have completed the Wilderness Hard diary and are able to choose their teleport location with the Wilderness obelisks will now find the list of locations is ordered via their Wilderness level. The Revenant teleport scroll will now take you to the northern cave entrance, as opposed to the southern one. The "Your resistance to poison is about to run out..." message will appear a little less frequently and in less sporadic locations. It is no longer possible to stack multiple Mud pies on the same target to reduce their run energy to 0% in a single game cycle whilst is a single combat area. Additional bank chests have been added to the Blast Mine to help improve the amount of viable areas to use dynamite. The names of fishing spots have been changed so they are more relevant to the method of fishing used there. For example, "Net Fishing Spot" has become "Big Net Fishing Spot" or "Small Net Fishing Spot". Completing Champion's scrolls will now also reward you with a lamp of experience which grants 10 times that of which you would normally be given from the challenge. You claim this lamp from a chest that has been added to the Champion's Guild basement. Players who have previously completed a Champion's scroll can obtain their unclaimed lamps from the same chest. Players may now right click music tracks to "Unlock hint" and be told which location the music track is unlocked in. Players are now able to move immediately after casting Bloom. This has not increased the rate at which people can Bloom and harvest Mort myre fungi. The left click option for Enchant jewellery tables has been changed to "Use". Players will now be able to withdraw the Prop Sword from the POH Toy Box, as originally intended. A graphical issue with male Ahrim skirts has been fixed. The size of diary boots has been reduced to assist in preventing some graphical issues. They now stop at the same height as other boots, as opposed to riding up the calf. Players should find that the final fight during the Lunar Diplomacy quest will start a little more consistently. Previously, it would sometimes take multiple attempts to start the fight. Last week we celebrated our 5th Birthday, and the celebrations continue with the release of our #MyFiveYears video! Take a trip down memory lane with Mods Ash, Ghost, John C, Kieren, Mat K, Roq, and Sween.